Our pets do not live as long as we do and so we are forced to deal with the death of our beloved companions throughout our lives. This is often the most difficult part of caring for a Tahoe Truckee pet dog, cat or other animal. Dr. Robinson provides end of life guidance and euthanasia services with compassion and care during this difficult time. Euthanasia services are performed in a gentle and compassionate manner. We strive to create a quiet and peaceful time for you and your family to be with your pet during their last moments. 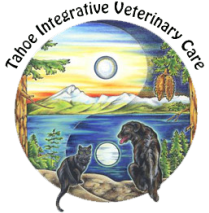 Tahoe Integrative Veterinary Care offers cremation services through A Beloved Friends Pet Crematory in Reno, Nevada. They offer compassionate and ethical aftercare for your beloved pets once they have passed.